Angel number 1238 is a message saying that abundance and prosperity are manifesting in your life. Keep a positive mindset and stay optimistic about your future, especially in regards to the financial aspects. If you do this, your abundance will continue to flow. Your prayers for increased wealth and income have been heard. Have no fear of loss in your life. Trust that more is on the way. 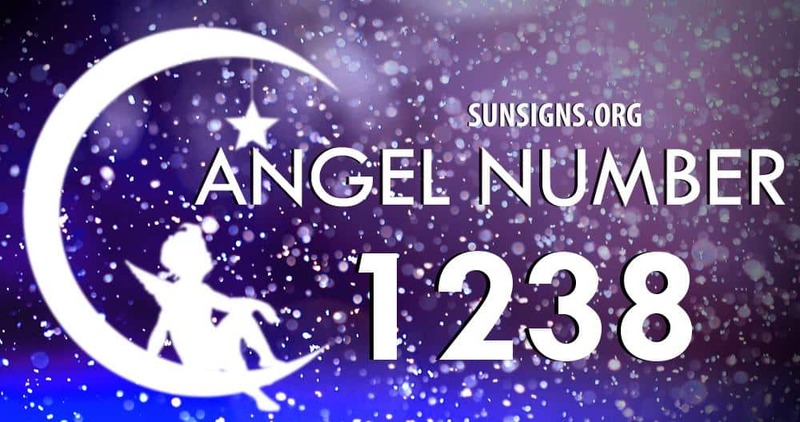 Angel number 1238 can also be a prompt to begin a spiritually based practice or career. The number 1 resonates strength, success, a connection of thoughts, and new opportunities and projects. Do not be afraid to take on new endeavors. Don’t focus on your fears; focus on what you’re capable of. Angel number 2 is giving off vibes of cooperation and duty. It can resonate a test of patience, because you have to believe that the Ascended Masters are answering your prayers, but it may take a little time. Number 3 is encouraging you to have faith that your prayers will be answered in due time, but to be patient. Trust your abilities and personal skills, and remember that the angels are by your side. Number 8 is the number of Karma. It is also the angel number of confidence, inner strength, inner wisdom, efficiency, trustworthiness, insight, a desire for peace, decisiveness, control, ambition, a love of humanity and a want for world transformation. The 8 brings encouraging messages telling of achievements and success down the road, so long as you remain optimistic and follow your instinct. Step into your personal power and have faith in your own abilities. Number 12 is to tell you to try looking for new ways to enhance your home and garden. The guardian angels are asking that you surround yourself with love and positive energy. 38 is a message saying continue listening to your intuition and inner intelligence. Do not be afraid to make positive choices and execute them as so. Keep going strong and abundance will present itself to you soon. You should be grateful for what you have achieved and for all your prayers that have been answered, and do not be afraid to share these with those around you. Number 123 is a steps number (1..2..3), which represent the steps an individual takes in their own personal lives. If you are having any doubts or fears, look to the angels and ask for guidance and assistance in any troubles you may be facing. Number 238 is letting you know that the angels are listening to you. Your requests for a change in income, wealth and financial stability have been heard and the angels are responding to them. Do not give up on the notion that more is coming your way, but find a way to use this “more” in a positive way in your life.